The new book that tells the astonishing true-life story of the man who invented the movies — and got away with cold-blooded murder! Freezing Time is the action-filled adventure of four fascinating people during one of the most thrilling chapters of American history: the late 19th century transition from the Wild West to the Age of Technology. There’s the narrator of our story, Eadweard Muybridge, the eccentric and mysterious photographer who conquers staggering obstacles to produce the first motion pictures; his young wife, Flora, one of the greatest beauties of San Francisco — and she knows it; Major Harry Larkyns, the English con artist who steals her heart and pays the ultimate price; and Governor Leland Stanford, the richest and most powerful businessman in the nation, who is both Muybridge’s greatest supporter and the engine of his most devastating downfall. For a limited time, you can buy the eBook version of Freezing Time for just $2.99. You can also buy one of the deluxe first editions illustrated with over 40 original photographs by Muybridge. Order Freezing Time in print. People remember Muybridge for his high-speed photographs of a trotting horse, which settled the long-running dispute over whether all four hooves ever leave the ground at the same time. Few remember that those photos were just a beginning for Muybridge. Through trials and tragedy he developed the technology to take an extended series of photos which became the first movies. Today he is an icon of "steampunk," the burgeoning 21st century artistic and literary movement that pays homage to Victorian-era technology. Muybridge had a stormy relationship with his patron, rail tycoon Stanford. Their collaboration ended in bitter betryal and a series of disastrous lawsuits. 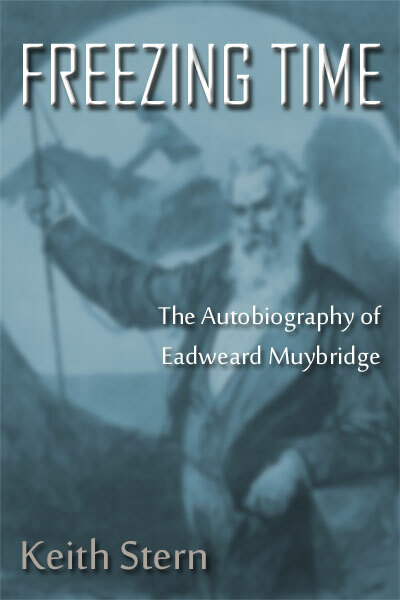 At the peak of fame, Muybridge married Flora, a stunning beauty half his age, who betrayed him in an affair with a dashing young con artist, Major Larkyns. Muybridge murdered Larkyns in cold blood, and a spectacular “trial of the century” ended in his astonishing acquittal. Freezing Time tells this story in the form of an historical novel. While maintaining accuracy and truth about Muybridge’s life and work, Freezing Time sets him into a dramatic context that is compelling to readers who may know little about him or his photography. The exciting adventure of his life and times as depicted in Freezing Time is like Indiana Jones meets The Time Machine mixed with elements of Jack The Ripper, Sherlock Holmes, and True Grit. For a limited time, you can read Freezing Time on Kindle, iBooks, Sony, or Nook for just $2.99. Or you can own Freezing Time in print.